The Keehi Lagoon is known as a breeding ground for hammerhead sharks, but state officials said it is not natural for shark pups to be found ashore in such large numbers, the Star Advertiser reported. Andrew Rossiter, director of the Waikiki Aquarium, told Honolulu's KHON that the young sharks were probably caught in a gillnet and then dumped on land by a fisherman. "To breathe they have to keep moving, so once they're in the net for even two to three minutes, they're unable to breathe and they suffocate," he explained. Rossiter said the state should have tougher laws to prevent such killings. "When it's the pupping season and it's a pupping area, then maybe they should restrict or ban the use of gillnets just for a couple of weeks to give them a chance," he said. Democrat Hawaii state Sen. Mike Gabbard, who co-sponsored a bill to ban synthetic gillnets, was devastated by the news. "I'm sick to my stomach about what's happened today," Gabbard told KHON-TV. "It's really giving me the incentive to make sure that this bill gets passed in 2019." The bill passed in the state Senate but has stalled in the House. Gillnet fishing has been found to be destructive to fish populations and to other marine species that get caught as bycatch, particularly sharks. 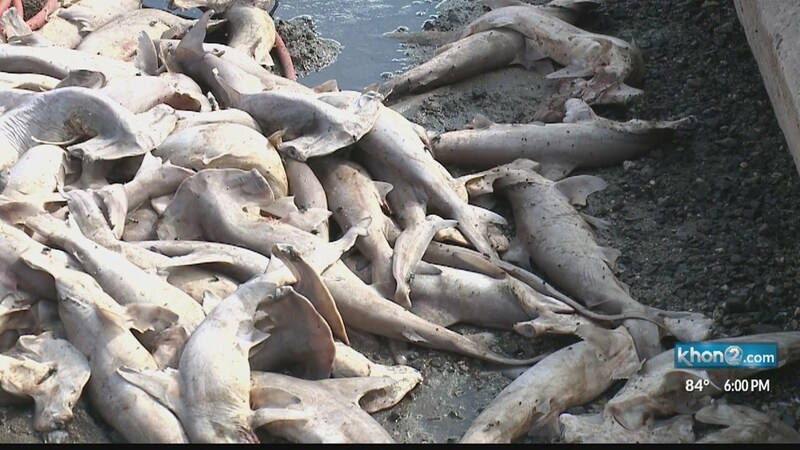 The UN's Food and Agriculture Organization (FAO) found roughly half of the sharks that are caught and sold were caught as bycatch in the high seas longline fisheries. Each year, tens of millions of sharks are caught as bycatch, according to estimates.